The Earth Day has, several times in the past, become an occasion for initiating environmental causes across the globe. 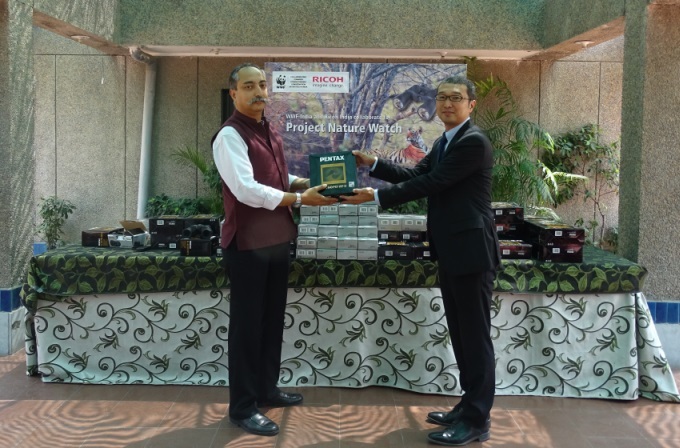 This Earth Day was no exception, when the World Wildlife Fund-India (WWF-India) and Ricoh India joined hands to strengthen wildlife and marine conservation in India, by signing the ‘Project Nature Watch’ partnership. WWF-India has been working towards wildlife and environment protection in the country since 1969. Ricoh is a global technology company. Together, they aim to contribute towards the environment by bringing in technology for better monitoring efforts across conservation projects in India. The aim is to provide need-based infrastructure support to frontline and field staff working in the forest and marine areas respectively, for monitoring species such as the red panda, snow leopard, tiger, elephant, rhino, olive Ridley turtle, and other threatened aquatic species and coral reefs. The equipment will not only help improve vigilance capacity of the staff but also keep them motivated and interested in wildlife. All the equipment will be manufactured by Ricoh Imaging Corp (Japan). Around 200 high-end Pentax binoculars will be handed over to the frontline staff of forest departments of Arunachal Pradesh, Assam, Chhattisgarh, Madhya Pradesh, Maharashtra, Rajasthan, Sikkim and West Bengal to support wildlife monitoring and patrolling activities. Water-proof cameras will also be extensively used by the WWF-India team working in marine habitats across the coastal states of Gujarat, Goa, Kerala, Andhra Pradesh, Odisha, and the Lakshadweep Island. The cameras will go a long way in helping monitor marine biodiversity in these locations and assessing the distribution, population status, health and behavior of several priority species. Speaking about the partnership, Mr. Ravi Singh, Secretary General and CEO, WWF-India, said, “Frontline staff in forests are the protectors of natural habitats, responsible for safeguarding wildlife populations. In coastal areas, our field staff ensure safety of several marine species. Mr. A. T. Rajan, MD and CEO, Ricoh-India, said, “Project Nature Watch in association with WWF-India is our endeavor to strengthen technology enabled conservation initiatives for forestry and marine ecosystem. We are hopeful this collaboration will lead towards prosperous biodiversity of our nation and natural capital for Earth at large.” We wish them success for this humane initiative on their part. NextSponsored Video: A Visit to Garden City Singapore Has Much to Offer!